Patrick Hoover and I “went out” for about three weeks in seventh grade. This means that a friend of his probably came up to me between fifth and sixth periods and said, “Patrick wants to know if you’ll go out with him” and I sent word back through the envoy that I would, indeed, go out with him, and by the end of the school day we were an item. I wasn’t allowed to go to movies with boys or to have them over (I still don’t think I am), so we mostly just hung out at the pool in my apartment complex. At the time, I was still harboring an obscene infatuation for the New Kids on the Block and listening to Casey Kasem’s American Top 40 every weekend on my clock radio. That’s what comprised my musical world. But then Patrick Hoover made me a mix tape. 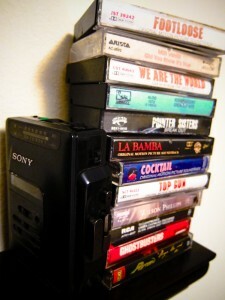 I have sifted through boxes of old cassettes trying to find it. I’ve unturned a slew of other audio treasures — the Ghostbusters soundtrack, the Footloose soundtrack, the Top Gun soundtrack, the Cocktail soundtrack, the La Bamba soundtrack, The Pointer Sisters’ Break Out, Kenny Rogers’ Greatest Hits, We Are the World, Milli Vanilli’s Girl You Know It’s True, Poison’s Open Up and Say … Ahh, The Chipmunks’ Urban Chipmunk, a still-wrapped copy of the eponymous Wilson Phillips album (most certainly a back-up) — but not the mix tape. Patrick was the baby of a big, big family of siblings, some much older. As a result, he had a side-splitting sense of humor (irrelevant to the story, but at the forefront of my memory of him) and his musical tastes were much worldlier than my own. I wish I could remember the exact and entire track listing, but I know these were on the tape: Fleetwood Mac’s “Tusk,” Scorpions’ “Still Loving You,” Rod Stewart’s “You’re In My Heart,” Led Zeppelin’s “Stairway to Heaven,” Queen’s “We Will Rock You,” “We Are the Champions” and “Bicycle Race” and two songs by U2. I’m pretty sure they were “With or Without You” and “I Still Haven’t Found What I’m Looking For.” Or maybe it was “Pride” and “Sunday Bloody Sunday.” Actually, maybe all four were on there, now that I think about it. I hate that that’s the fuzzy part. But, in my defense, there are no fewer than 200 U2 songs swimming around in my brain nearly 20 years later, but I still know just one Zeppelin song, therefore I know without a doubt that’s what was on the tape. Regardless, it was a pretty mind-blowing playlist for someone who wrote in a fifth-grade slam book (Google it) that Belinda Carlisle’s “Heaven Is a Place on Earth” was her favorite song. 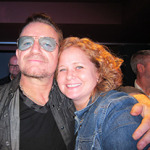 I’m sure I’d heard U2 on the radio and seen them on MTV, but this was my first repeated, intentional exposure to them. I wore that tape out in my Sony Walkman. On road trips with my family. On the bus to and from Raa Middle School. On my grandparents’ screened-in porch, swinging in the wooden swing as my feet dragged back and forth on the green Astroturf carpet. I wouldn’t become a deliberate U2 fan until a few months later when I heard a boy I had a huge crush on (Patrick and I didn’t make it) singing “Mysterious Ways” and Achtung Baby shifted my universe. But I’m grateful to Patrick Hoover for priming me for my favorite album, rescuing me from certain mainstream radio death, upping my cool points and bringing down the NKOTB posters from my walls. Though, I am toying with the idea of working an NKOTBSB show into my summer U2 schedule. So funny! You definitely need to go to the NKOTBSB concert!!! I had a Patrick, too. His name was (is) TJ. It was Love Rescue Me, though. Or maybe, When Love Comes to Town. (Fuzzy, as well) It wasn’t a mixed tape, either…just R+H on the boom box during youth group making of a haunted house. PS….what self-respecting mixed tape DOESN’T have Stairway on it? !